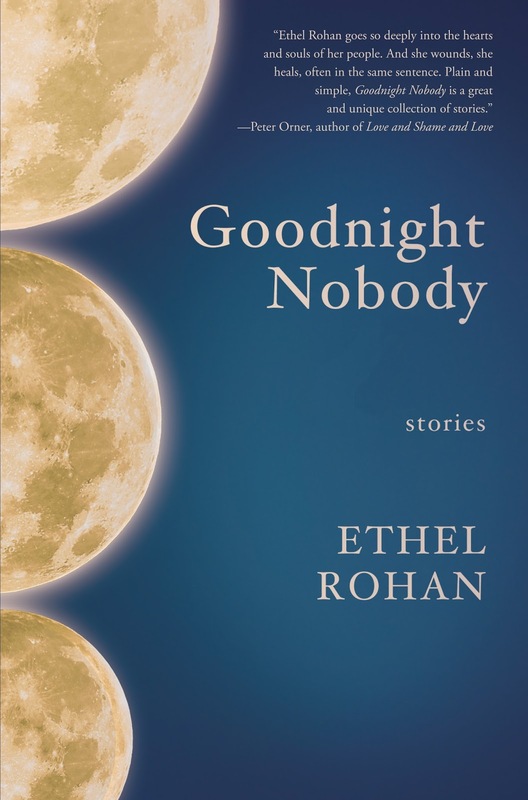 Secrets and fears are indeed the tense, thrumming undercurrent of all of Ethel Rohan's short stories in her riveting and hauntingly titled new collection Goodnight Nobody (Queens Ferry Press, 2013). In them, Rohan takes everyday kinds of characters and everyday kinds of moments, strips them to their core, finds their essence, and sends them back to you with emotion simmering so close to the surface you think they might explode. The characters in Goodnight Nobody all verge on the brink of psychological danger, approaching the brittle edges of painful memories, unexpressed feelings, or loss too great to bear. In "Flash," while struggling with her family's imminent financial ruin, the middle-aged sister and caretaker of a brother with a disability bitterly envies him his naivete. A recurring carpet stain reminiscent of of a woman's deceased mother becomes a poignant source of comfort in "Keepsake." In "Darkroom," a woman only days from the permanent loss of her eyesight scrambles boldly over the fence of the giraffe's pen at the zoo in hopes of one good, last look at the magnificent animal. Isolation and loneliness are a common theme in the collection, whether caused by loss, disappointment over things that will not come to pass, or simple failure to connect. One of my favorite stories, "Bee Killer," explores the profound divide between a husband and wife. The husband, obsessed with beekeeping, cannot seem to see his wife or her jealousy of the bees that preoccupy him. She is invisible to him, and goes to great length to get his attention - plunging her hand into a swarm in the hopes of getting stung, aiming a shotgun at the hive. In a last, desperate attempt, the woman takes on the characteristics of a bee, and in an act both glorious and heartbreaking, dances a bee dance for him. These moving stories also offer glints of hope. We imagine that the photographer, buoyed by the thrill of her encounter with the giraffe, is perhaps prepared in a new way for the blind future she cannot fully anticipate. Maybe the husband will finally understand his wife in the dance of the bee. In the familiar routine of watching Flash Gordon with her brother, the sister might move beyond her anger and find reassurance in the constancy and ritual of their life together. Rohan tells these tales with sentences that are at once fragile and fierce, wielded with both expert precision and a vulnerable heart. In each case, the potential peril is made visceral, and this is what I loved most the stories in Goodnight Nobody. The reader may experience them in that almost physical way one does only when an author has written dangerously, reaching deep inside herself and and the lives of her characters in order to bring them to light. Highly recommended for all lovers of literary flash/short fiction. It is my great pleasure to welcome Ms. Rohan as a guest on the blog today- read our Q&A here. 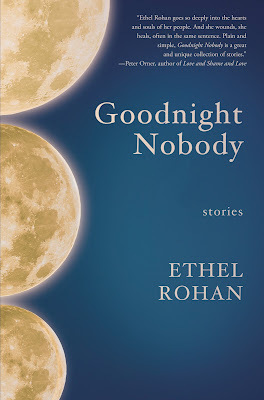 My thanks to the publisher for a complimentary review copy of Goodnight Nobody. Happy reading!